Peter Martin: Election night tonight - go Liberals! I am allowed to say "Go Liberals" now. In 2001 when I worked for the ABC the then head of news and current affairs phoned me at home on election eve and ordered me not to hand out how-to-vote cards (for an independent candidate) as I had planned to. Apparently it would be inappropriate, "given my position" at the ABC. You know what the ABC is like. Anyway, I am talking about South Australia, my ancestral home. My rule of thumb is that if a government has been in office for around 10 years it is time for a change. Labor has. Colleague Katharine Murphy is on the ground and can't detect a mood for a change. 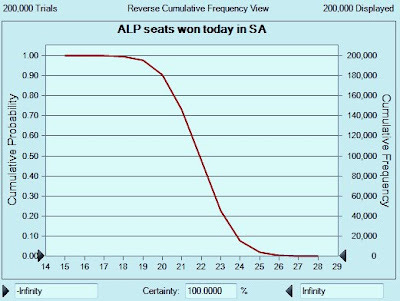 Yes, the NewsPoll figures suggest there's just an 8 per cent chance of that happening. ABC NewsRadio will be covering both counts all night for those of us interstate. You still call AAMI Stadium, ' Footy Park '. Your dads best friend friends next door neighbour knows some one in the Hells Angels that can get stuff.
. "Climate balance urged at ABC"
. Are State Elections Affected by the National Economy?